Labeled as the next best thing to Botox, Argireline is a non-toxic muscle relaxing ingredient that helps to smooth out wrinkles when used topically. Although Argireline has been around for many years, it didn’t really capture the attention of most beauty care manufacturers until Dr. Oz promoted it as one of the best ingredients to be found in eye creams. Today, skin care companies use this ingredient often in combination with other anti-aging ingredients to help reduce the signs of aging. So, if you are looking for the best face cream with argireline, then one of the products in this review may be what you need. Comes in a white 2 ounce container with a blue label. Contains such skin healthy ingredients as Matrixyl, Argireline, Hyaluronic acid, vitamin C and Vitamin E.
It does not contain any parabens or sulfates and is free of petrochemical derivitatives and fragrance. Reduces wrinkles- People say that some creases in their forehead as well as mouth lines and other types of fine lines definitely look less visible. Brightens the skin tone- Their face looks refreshed with a brighter skin tone. Tightening- Even few people who said that this is not the best moisturizer they have ever used did mention that it nonetheless offers a slightly tightening effect. Softens your skin- As an effective moisturizer, this cream also helps the skin become soft to the touch. It is light and non-greasy once on- People feel it is very light on their skin without leaving any greasiness. Moisturizes well- Just a little bit is enough to leave their skin well moisturized for the day. 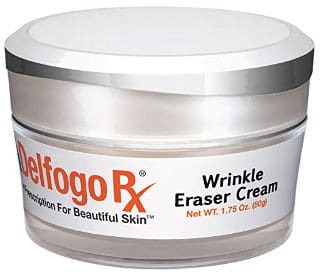 While this Perfect Image Wrinkle Cream is specifically designed to treat dry reddened skin after a “criminal peel’, many people it once or twice a day to help moisturize their skin and reduce wrinkles. Contains Matrixyl 3000 and Argireline to relax muscle tension and encourage the production of collagen. Good for wrinkles, fine lines, rough, dry, dehydrated skin, stretch marks and cellulite. Professionally formulated hydrating repair kit. Distilled Water, Aloe Vera Gel, Cetyl Alcohol, Glycerin, Butylene Glycol, Carbomer, Polysorbate 20, Palmitoyl Oligopeptide, Palmitoyl Tetrapeptide-7, Acetyl Hexapeptide-8, Hyaluronic Acid, Stearic Acid, Glyceryl Stearate, PEG-100 Stearate, Dimethicone, Sorbitan Stearate, Propylene Glycol, Diazolidinyl Urea, Iodopropynyl Butylcarbamate, Acrylates/C10-30 Alkyl Acrylate Crosspolymer, Triethanolamine, Green Tea Leaf Extract, Cucumber Fruit Extract, Chamomile Extract, Comfrey Leaf Extract, Retinol Palmitate. Place a small amount of this face cream on your fingertips and gently massage into the affected area using upward and outward strokes. Massage into your skin for 15 to 20 seconds. The reviews are exceptionally good with the majority of users finding this Argireline face cream effective at treating dry and wrinkled skin. Few users experienced a burning sensation, but overall users found this cream safe and effective. Absorbs Easily– People liked that fact that it absorbs quickly, leaving behind no greasy residue. Improves Skin’s Texture– They also find that this cream soothes their skin almost immediately and overtime they see that their skin begins to heal. Most users feel that their complexion feels softer and more pliable. 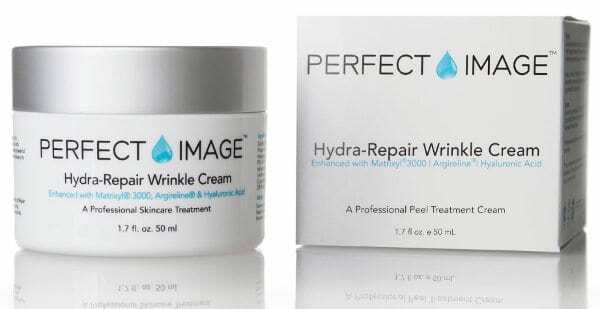 Reduces Wrinkles– Perfect Image Hydrating Repair Peptide Wrinkle Cream reduces fine lines and wrinkles. There is no report of this skin cream either reducing stretch marks or cellulite. Comes in a rather elegant looking jar. 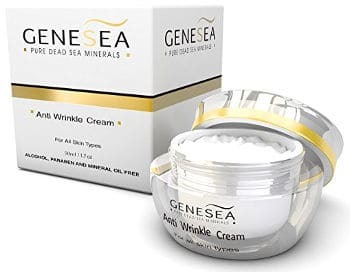 This cruelty free cream is lightweight and is designed to reduce wrinkles and fine lines, firm the skin, boost hydration levels and smooth the complexion. It is paraben, alcohol, sulfate and mineral oil free. It is made in Israel using Dead Sea minerals. A 30 day money back guarantee is offered by the company. Moisturizes well- Increases moisture levels of the skin also helping deal with dryness. Softens fine lines- Some users have mentioned that their fine lines have been less visible after using this product. Goes on smoothly and is non-greasy- It feels lightweight and goes on smooth without causing any reactions even to sensitive skin types. Comes in a 2 ounce container. It contains DMAE, MSM, Niacinamide, pure Hyaluronic Acid, Argireline, and Matrixyl 3000. Other great skin care ingredients are: some vitamins of the Vitamin B Complex, vitamin E, Green Tea Extract, Retinyl Palmitate, Witch Hazel as well as Salicylic Acid which are good for oily and acne prone skin types. This cream is recommended for oily, dry, normal and acne prone skin types. Doesn´t make skin oily or clog pores- Causing no oiliness or breakouts is a huge advantage for users that have oily and acne prone skin. 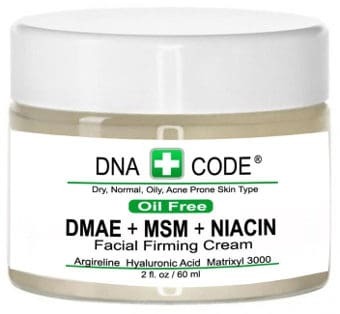 Goes on extremely smoothly- The texture and rate of absorption of a cream is obviously a thing to consider when you are looking for the best Argireline face cream, and this lightweight DNA CODE cream does, according to users, go on nicely. Firms within 20 minutes of applying it- Users like the firming effect this product offers. Is non-irritating- It does not contain harmful chemicals and fillers which can cause skin reactions. Etal Anti Wrinkle Moisturizing Cream not only contains Argireline and Matrixyl 3000 but also a number of vitamins and minerals. Contains known anti-aging ingredients such as Hyaluronic acid, Matrixyl 3000, Argireline and Renovage as well as vitamins A, B3, and E.
Stimulates collagen production and reduces fine lines and wrinkles. Aqua, cetearyl olivate, sorbitan olivate, cetearyl alcohol, coco-caprylate, Argireline®, Renovage®, Matrixyl®3000, niacinamide, sodium hyaluronate, xylitol, Vitamin C, glycerin, Vitamin E, Vitamin A, shea butter, aloe vera leaf juice, green tea leaf extract, boron nitride, sclerotium gum, orange fruit extract, phenoxyethanol, caprylyl glycol, potassium sorbate. Absorbs Well– This face cream absorbs well, leaving the skin feeling healthy and smooth while helping to hydrate it, too. Non-Irritating– Users are pleased that this product does not irritate or cause acne breakouts. Plumper and Tighter Skin– People actually feel that after using this facial cream, their skin looks plumber, firmer and has fewer wrinkles. Reduces up to about 30% of those fine lines and wrinkles in about a month. Moisturizes and nourishes skin with vitamins and minerals. Contains both Argireline to relax muscle tension and Trylagen to boost collagen production. Water, Cetyl Alcohol, Sodium Acrylate/Sodium Acryloyl Dimethyl Taurate Copolymer, Glyceryl Stearate, Caprylic/Capric Triglyceride, Glycerin, Sweet Almond Oil, Acetyl Hexapeptide-8, Cetyl Alcohol, Sodium Polyacrylate, Dimethicone, Saccharide Isomerate, Trylagen®: Pseudoalteromonas Ferment Extract, Hydrolyzed Wheat Protein, Hydrolyzed Soy Protein, Tripeptide-10 Citrulline, Tripeptide-1, lecithin, Xanthan Gum, Carbomer, triethanolamine, Phenoxyetanol, Butylene Glycol, Caprylyl Glycol; Ubiqinone 50, Squalane, Sodium Carboxymethyl Betaglucan, Aloe Vera Gel, Propylene Glycol, Diazolidinyl Urea, Iodopropynyl Butylcarbamate, Sodium EDTA, Avocado Fruit Extract, Carrot Root Extract, Cucumber Fruit extract, Ginseng Root Extract, Linden Tree Leaf Extract, Tromethamine. Dot face cream on face focusing on the forehead, under eye area, and wherever there are fine lines and wrinkles. Gently smooth in. Reviews for Face Whisperer Day Cream are good with the majority of users finding that this face cream does what it intends to do. There are a few users who experienced breakouts after using this product but these complaints are the exception rather than the rule. Goes on Smoothly– People state that this cream goes on smoothly and absorbs quickly, making the skin feel more moisturized almost instantly. With continued use they find that their skin feels smoother and looks healthier. Reduces Wrinkles– Most users see a reduction in wrinkles in just few weeks time, and state that with regular user their skin looks noticeably younger. Comes in a silvery white jar containing 1.75 ounces of this cream. Among its ingredients are Pharmaceutical Grade Peptides, Matrixyl 3000, Argireline, Leuphasyl, Hyaluronic Acid and Eyeliss. Absorbs quickly- It spreads around easily without leaving any extra residue on the skin. Lessens wrinkles´ depth- According to quite a few of users, this product has largely helped them to improve the appearance of expression lines and creases. Also, some people review that it has reduced the depth of their wrinkles on the chest and neck. Non-greasy- It absorbs very quickly and does not leave a greasy feel to the skin. Affordable Product- People are pleased with the price of this Argireline face cream. 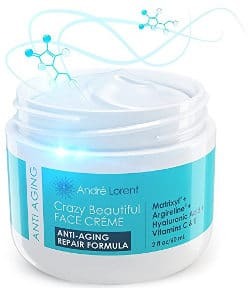 In conclusion, if you are looking to reduce those fine lines and wrinkles, finding a good moisturizing cream that contains Argireline may actually help you look and feel younger.